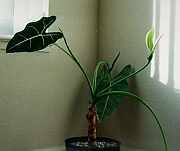 A rather commonly found Alocasia, readily available in garden centers. 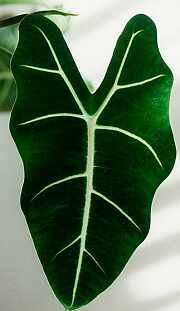 Has gorgeous velvety leaves. It is a wide-leaf form of A. micholitziana from the Philippines (this plant has been identified by Dr. Alistar Hay). It is rather susceptible to spider mites when grown under low humidity conditions. This species grows very well under fluorescents; in fact, it does not like high levels of light (60% shade cloth is not enough to make it happy in my California greenhouse). It may need air-layering once every two years or so, to get rid of the rather unappealing trunk. General habit of a mistreated plant. In early spring, thinking the weather is going to be nice, I put this one outside for a couple of days. Wind and cold have nearly killed it, but it is starting to recover. This plant is about a year old. Closeup of a leaf. The light translucent spots indicate minor damage inflicted by spider mites. The inflorescence has a somewhat strange smell resembling a freshly cut potato, with sweet undertones. Strangely appealing and disturbing at the same time, but you ahve to stick your nose into the spathe to really smell it. 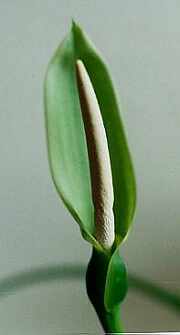 In an attempt to inflict self-pollination, the spathe has been cut open and pollen from another inflorescence transferred here. Nothing happened.